Many people don’t consider golf carts a true vehicle, and as a result, don’t think of the damages that a golf cart accident can cause. While some golf cart accidents result in little more than a few dents or scratches in the paint, others are much more serious. This is especially true in smaller Florida communities that use golf carts for transportation. Many Florida retirement communities forgo using their cars or other vehicles to travel around the community and instead use a golf cart. As a result, accidents that occur can be more significant in nature due to individuals using higher speeds than at a golf course, and the lack of bodily protection that a golf cart provides. There are many different types of golf cart accidents, some of which are more serious in nature than others. A single golf cart accident occurs when only one golf cart is involved in a collision. For example, a single golf cart accident can happen if a driver runs off the road or loses control of the cart, or if the cart is driven into a tree or building. These types of accidents occur when two or more golf carts are involved in a collision. 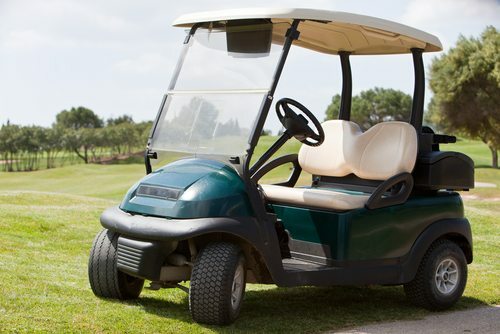 A multiple golf cart accident can be as minor as a fender bender, or if high speeds were achieved, individuals may be thrown from the cart upon impact. A golf cart accident involving a pedestrian may be particularly damaging, especially if the golf cart was going very fast. Even lower speeds can result in serious injury if the pedestrian is knocked down onto the pavement. Golf cart accidents with automobiles are likely the most dangerous, simply due to the sheer size and force of the automobile. Golf cart accidents with automobiles can be very serious, and can result in critical injuries and even death. Injuries that can result from any type of golf cart accident include head injuries, brain injuries, broken bones, lacerations, back and neck injuries and more. If you or a loved one were the victim of a golf cart accident, it’s important that you receive medical treatment right away. Even if the accident seemed minor, it is critical that you go to the hospital or visit your family doctor immediately to be evaluated for injuries. Once you have received medical treatment for any injuries that you have, contact a seasoned Florida golf cart accident lawyer. At the Slonaker Law Firm, we have extensive experience representing victims of these types of accidents and their families, and can help you obtain the compensation you need after being injured. Call us today to schedule an appointment for a consultation at 352-629-6656 or 888-629-6656. We are available now to assist you.